The amazing speed and stability of the Smart ENVE System continues with the 4.5 Carbon Clincher Wheelset. Its 48 mm / 56 mm front and rear depths bridge a middle ground between ENVE's shallower 3.4 and deeper 6.7 models for a wheelset that excels all around. This model has been updated with ENVE's molded-in textured brake track to give it 30% increased performance that stops equally well in the wet or the dry. Like others in the SES range, the 4.5 was developed independently in the wind tunnel to create an ideal profile that gives the best performance possible. 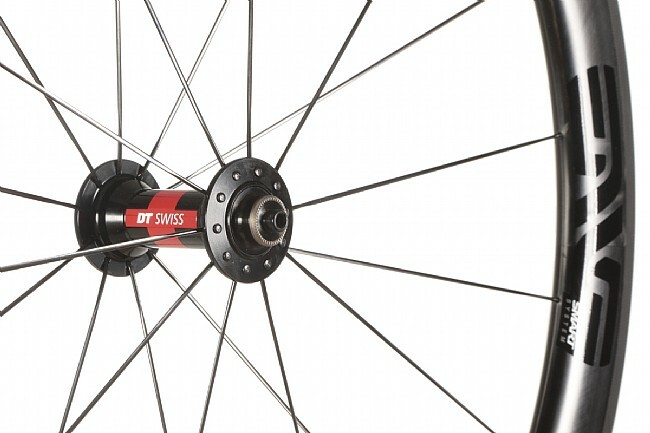 In fact, the 4.5 has the best lateral stiffness of any SES wheelset. Venerable DT Swiss 240 hubs provide outstanding performance in the durability, weight and smoothness departments. And DT's Aerolite bladed spokes hold it all together, providing exceptional strength while furthering the lightweight, aerodynamic advantage. This wheelset includes quick release skewers, carbon brake pads, and 39 mm valve extensions. 27 mm wide front rim / 25.5 mm wide rear rim. 20 hole front / 24 hole rear. Claimed weights are 683 g front / 843 g rear / 1526 g total. I'm Anonymous from Middle Tennessee - the guy who gave the previous review. In that review, I expressed some dissatisfaction with how flexy the rear wheel was. The longer I had the wheels, the more annoying the flex became until I contacted ENVE and asked if there was a less flexible wheelset they would recommend. 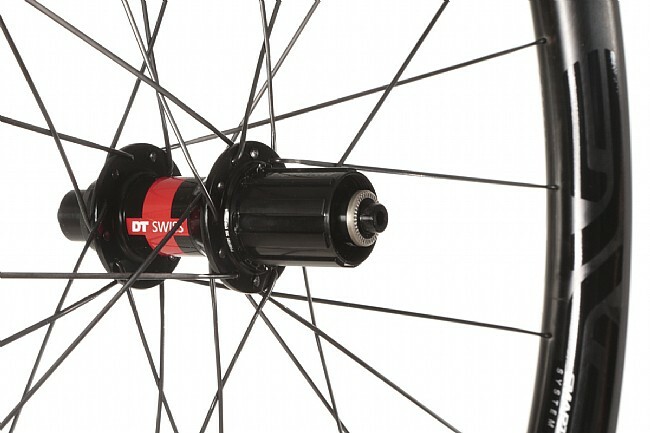 ENVE customer service recommended re-spoking this rear wheel with DT Competition spokes. They emailed a UPS shipping label and promised a 3-week turnaround. They actually finished the re-spoke in 3 days and returned the wheel via 2d Day Air. With the new spokes, the flex issue is gone. No brake rub - even with the brakes adjusted close - and no flexy sensation at all. And the wheels inspire a lot more confidence on sketchy pavement and steep descents. Great customer service from ENVE . . . and now, I will give the wheels 5 stars! Great wheels, and a great hub set!! edge in stopping power, much better than the older slick brake track, on the previous wheels. Super happy with them! These are my first full carbon clinchers. I've ridden Mavic's aluminum, non-aero Ksyrium series for 10 years, so my perspective naturally has these as a baseline. My rides with the ENVEs to this point have been in hilly areas with lots of 10% grade and with one ride having 20 mph crosswinds. Nothing in the rain yet but, besides rain, I've ridden these wheels in all the situations where any weaknesses should show. So, what are my thoughts? First, the wheels are very quiet. The DT Swiss 240 freehub is extremely quiet - so quiet that one rider riding beside me commented that he couldn't hear the ratchet at all. The quietness means you get almost no vibration from the freehub, which contributes to . . .
Second, the wheels roll very smooth. Even at 90psi100psi frontrear, the wheels seem to smooth out chipseal even riding winter training tires (Gatorskins). (I normally run 80psi front and rear.) I expected harshness, but these wheels are not harsh by any means and they roll smoother than my Ksyrium Pros on the same roads and even a little higher pressures. Fourth, how about crosswinds? I rode these wheels on an extremely windy day with unpredictable crosswind gusts. I could feel the crosswinds push, but it was never uncontrollable or nervous. Not much more than it would have been with the low profile Ksyriums. I was pleasantly surprised. I wouldn't shy away from these wheels for fear of crosswinds. It's not an issue. Previously I was using Enve Classic 45 tubular wheels on my TT bike. I bought the Enve SES 4.5 so I could use on both my TT bike and my road bike. For the same local race the prior year I was 2nd place in my age division but this time I was able to get first place because I took a full 4 minutes off the 20K bike leg and that included some climbing. I am convince that the SES 4.5 with Continental 4000 IIS tires is significantly faster than my Enve 45 Classic tubular wheels. That race was also on wet roads and the braking is also greatly improved, especially when wet, but at the cost of more noise due to the textured brake surface. Initially I was getting more braking noise than I felt acceptable but Enve has great customer service and working with them I was able to reduce the noice, but it still sounds like a jet engine when braking. I have had a chance to do several rides on my road bike. The depth is not so great that I can't handle in a cross wind and I am only 133 lbs. Due to my light weight I stayed away from the deeper Enve wheels. For me these wheels were the right purchase to use on both my TT bike and road bike. I use a 700x25 tire which is the recommended width and that has helped to reduce the rolling resistance, which I believe is part of the improvement in speed. I was going to compete in the World Championship for the Duathlon but was coming off an injury that impacted my running so I decided to get some new wheels to at least help with my bike speed. Previously I was using Enve Classic 45 tubular wheels on my TT bike. I bought the Enve SES 4.5 so I could use on both my TT bike and my road bike. I was happy with the wheel speed at the Worlds competition. Also I recently used them at a local Duathlon. For the same local race the prior year I was 2nd place in my age division but this time I was able to get first place because I took a full 4 minutes off the 20K bike leg and that included some climbing. I am convince that the SES 4.5 with Continental 4000 IIS tires is significantly faster than my Enve 45 Classic tubular wheels. What a pain to mount tires! I normally can change a flat in less than 5 minutes, but with these 4.5 is so hard to mount the tire. Wheels roll really nice , enve please fix the design of the wheels. Bought these to use as my every day wheels and my typical rides include 30 miles during the week with some well over 100 on the weekends. As an all around wheel they do very well including climbing, descending and high speed flats and brake well when wet. They are obviously fast, a noticable improvement over my 25mm aluminum wheels, although hard to quantify how much faster. I will say I have set new Strava PRs including climbing with these and some at lower wattage than previous bests where I have ridden the segments hundreds of times. Weight with rim strips on (they come installed) were 1579g for the set without skewers. The skewers are nice looking and light but I use a set of Bontrager skewers as the Enve's were allowing too much flex and had some brake track rubbing on climbs - which is noticeable from the brake track. 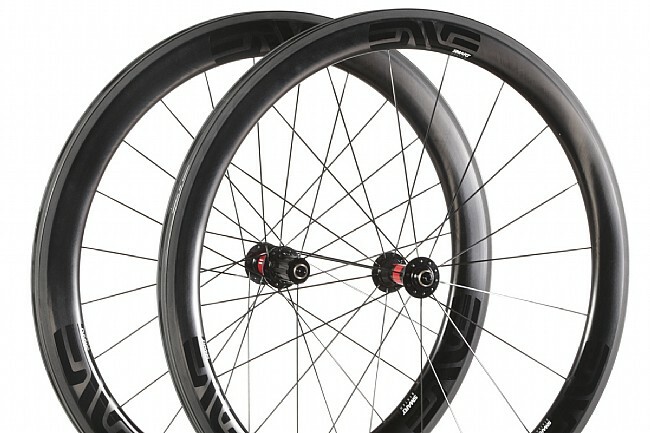 I am a heavier than average cyclist at 185lbs which contributes somewhat I am sure to the flex, but I do need to run the brake to rim air gap a little larger with these than on my C2s. The brake track makes sound a bit like a bottle rocket or jet, but not too loud - people in a pace line do know you are braking for sure. They are very effective for stopping performance. My assessment is you need less lever pressure wet or dry to stop when compared to aluminum brake tracks. The wet braking is not as good as dry which is claimed, however it is very good, no issues with it at all. Overall, I am very happy with these and would recommend them.